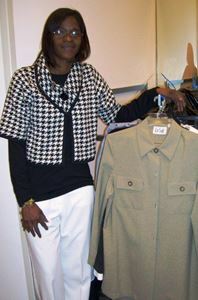 Kimberly Davis, Asst. Mgr. of the Dress Barn in Pecanland Mall, with the business attire collected in the Monroe-West Monroe BPW and Dress Barn "Dress for Success Send One Suit Drive."